districtchronicles students can sell The Norton Anthology of African American Literature (ISBN# 039392369X) written by Henry Louis Gates Jr., Valerie Smith, William L. Andrews, Kimberly Benston, Brent Hayes Edwards, Frances Smith Foster, Deborah E. McDowell, Robert G. O'Meally, Hortense Spillers, Cheryl A. Wall and receive a $19.44 check, along with a free pre-paid shipping label. Once you have sent in The Norton Anthology of African American Literature (ISBN# 039392369X), your Independent , DC Area textbook will be processed and your $19.44 check will be sent out to you within a matter days. 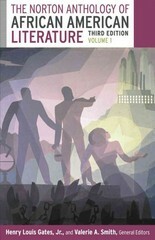 You can also sell other districtchronicles textbooks, published by W. W. Norton &Company and written by Henry Louis Gates Jr., Valerie Smith, William L. Andrews, Kimberly Benston, Brent Hayes Edwards, Frances Smith Foster, Deborah E. McDowell, Robert G. O'Meally, Hortense Spillers, Cheryl A. Wall and receive checks.